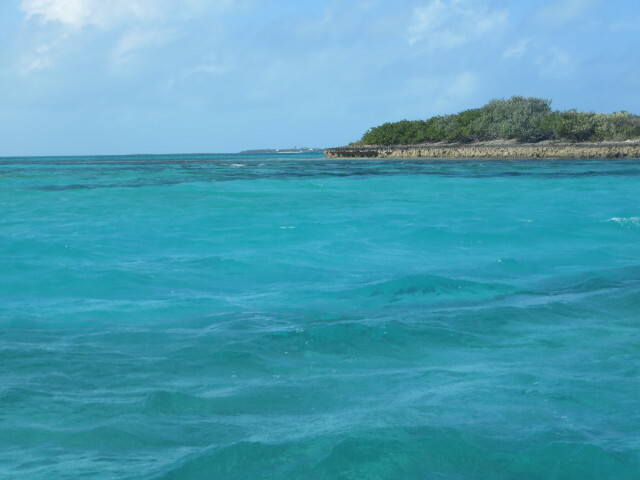 Our original, plan 3 months ago, was to visit the upper Exumas first and then head north to the Abacos. As the holiday season approached, I thought long and hard about where I wanted to be for Christmas. First choice – home with family. Life is about choices and sometimes you really can’t have it all. We chose to go home in early November for my Dad’s 90th birthday. That’s a very special event, we would get to see our family, and it would be without the assorted holiday craziness (let’s admit that the holidays, although wonderful, can also be a bit stressful and crazy). That said, I knew that it would be sad to be apart on Christmas. Next best choice would be Christmas in Hope Town! 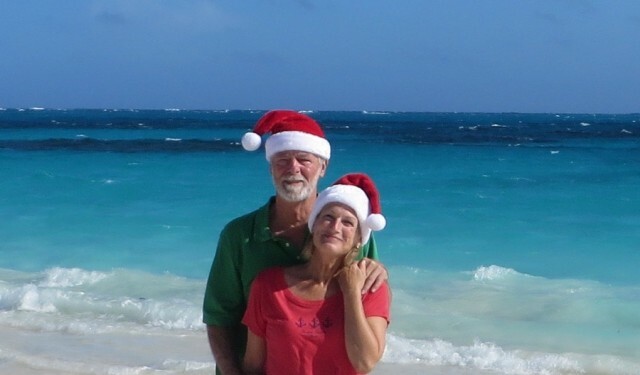 We had wonderful memories from our stay here during the holidays in 2013 – I knew I would feel much better if I were spending Christmas here where we have many friends rather than in the Exumas, which are considerably more isolated. 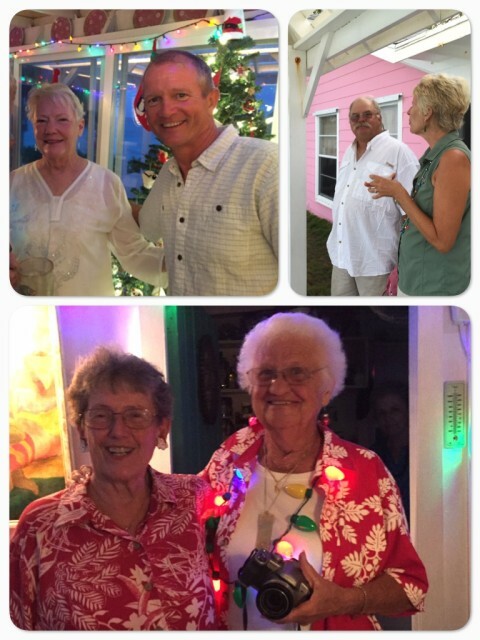 Hope Town does the holidays with unrestrained exuberant enthusiasm – it is a wonderful whirlwind which really helps to decrease any home sickness. The comparison between our typical New England Christmas and Christmas here is a study in contrasts and similarities. Instead of frantically preparing our home for the holidays with decorations, cooking and shopping, we get to enjoy festivities with a lot less work. To our northern eyes, it still seems odd to have sand under our feet instead of snow, and a warm, humid breeze in our faces instead of that brisk cold air. But wait! 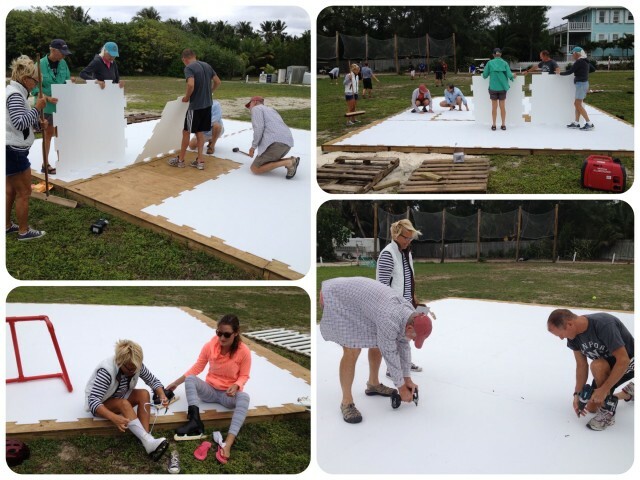 From what we hear, the weather wasn’t all that different between the Bahamas and Connecticut for Christmas 2015. Weather aside, the shopping wasn’t finished back in the states, can’t carry decorations on the boat, and sure can’t bake all the cookies and fancy meals in my little galley. So, the only thing we could do is join in the festivities! 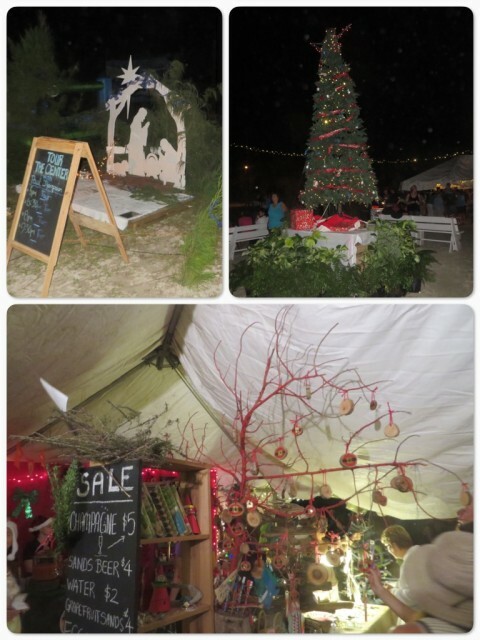 Couldn’t miss our first event – We went to Captain Jack’s Trim-the-Tree night. Bring an ornament and get a free drink. It was pretty cool to see my two Christmas box ornaments from 2013 hanging on the tree! Lacking a new inspiration, I made two more to hang for this year. In fact, I made quite a few boxes, filled them with Dove dark chocolates and gave them away to friends here in the harbor and on the island. It’s one of my favorite things to do for the Christmas spirit. It reminds me of my mother who taught me how to make the boxes. Our children each get a bag of 25 to open as an Advent calendar. Top pic – A basket filled with some of my little boxes. Bottom pic- Lisa C., a 6th grade teacher in Glastonbury, my former school district, sent me a photo of her 6th graders’ boxes. 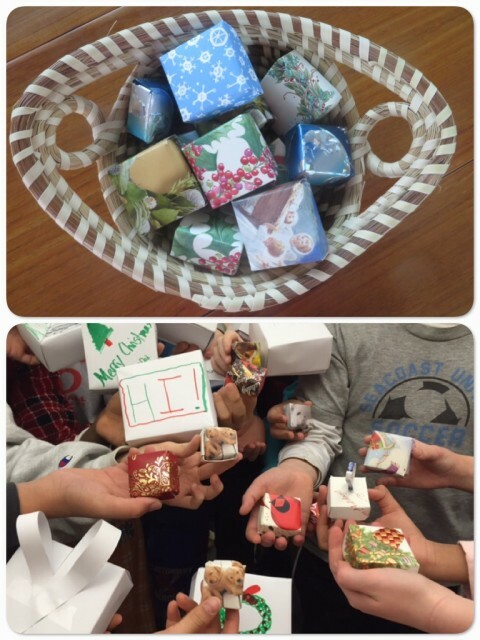 I passed the tradition onto the 6th grade teachers at Gideon Welles School, who continue to make the boxes with their students each year. I love that the tradition lives on. Makes me feel so good! Magnus and Charlotte (Swede Dreams) on the left and us on the right after hanging our ornaments on the tree. Just a few days after that evening we attended the St. James Christmas play, “Christmas in Black & White, Discovering the Real Story of Christmas.” Fifty-two children of all ages performed in this delightful production that unashamedly proclaimed “Christmas” loudly and clearly, instead of the politically correct, “Happy Holidays” message. I wish I could share a few photos from the evening, but alas, these also reside in the black hole that is now my Mac. Someday, even if it is not until next summer, my Mac will be revived and I will return to this post to add those photos. UPDATE: So glad the Mac is back so that I can share the photos of this wonderful play. 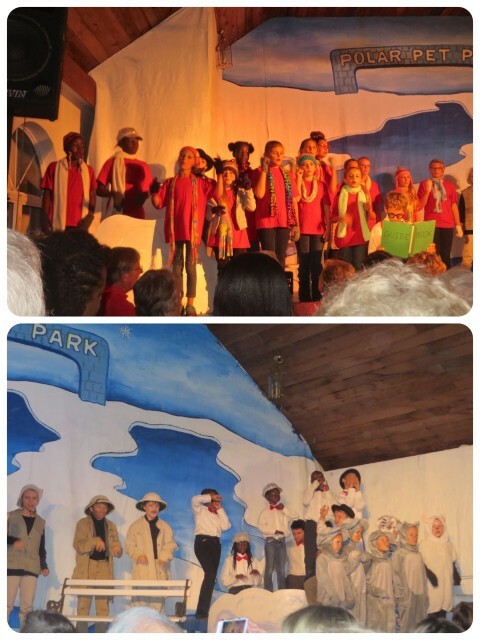 The “Polar Park” theme is clearly evident from the set design to the costumes. 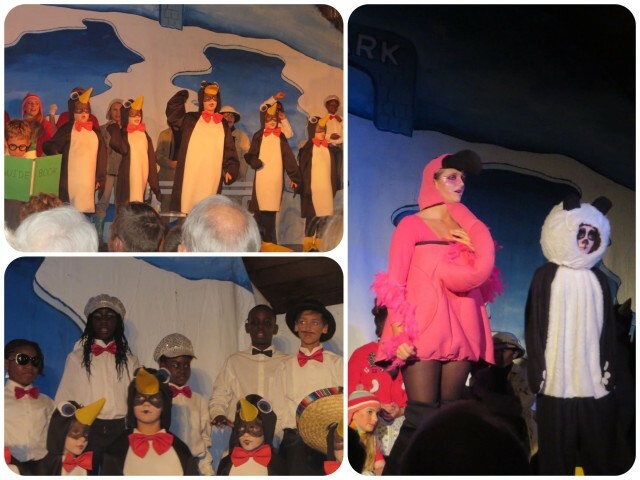 This group of penguins were the hits of the show. And check out the flamingo costumes – pretty creative! 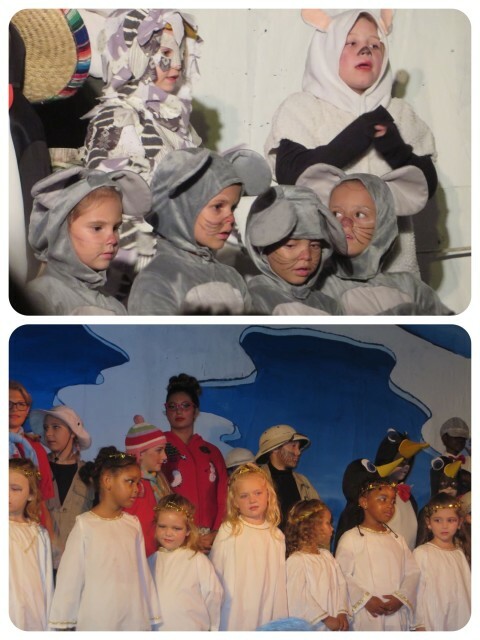 Favorite part — the little mice and the sweet little angels. I suspect that caroling in the streets is a childhood tradition from the past for most of us. I can’t recall the last time I went caroling at home or anyone came to our house. 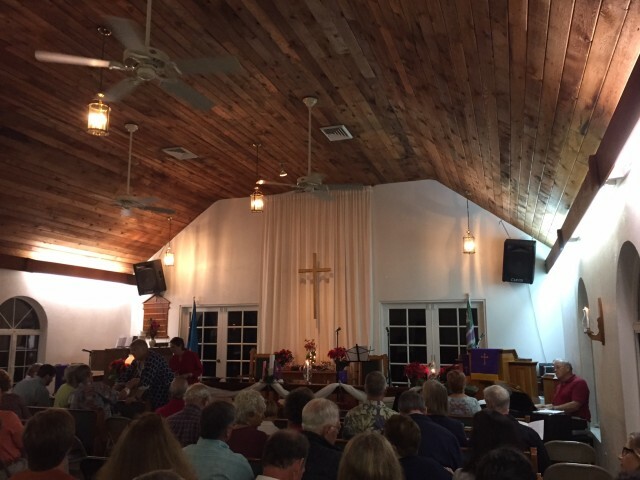 Here on Elbow Cay, It’s a big annual event and everyone joins in, including us, and we are both terrible singers! 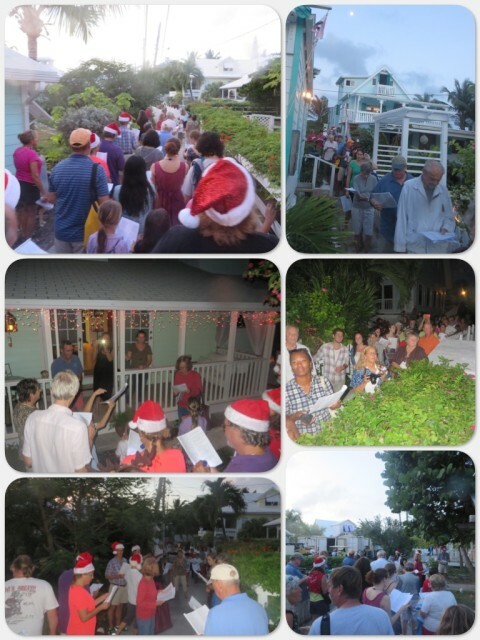 The streets of Hope Town village were filled with caroling voices. 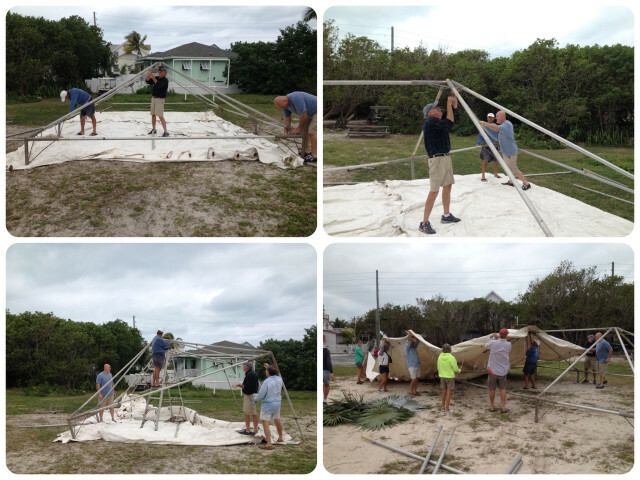 The tent raising- Sam, Magnus and a few other hardy souls worked on this project. That ice skating rink? Here is Al, Dan, Marcia, Kayda are piecing it together on the wooden platform and then screwing it down fro a smoother surface. Charlotte is the first to test it and break it in. 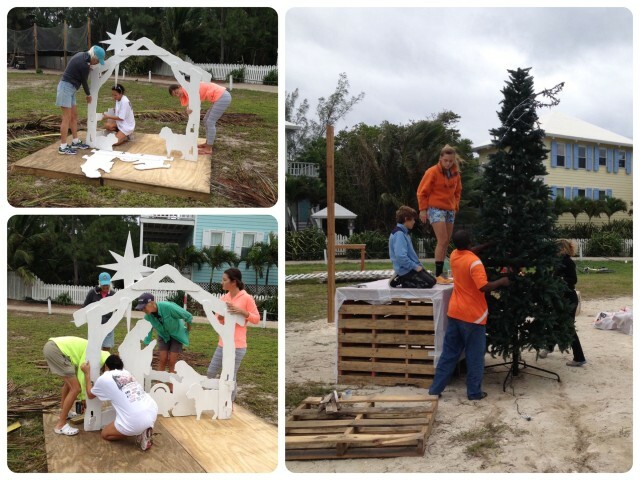 The wooden white nativity scene is assembled and the Christmas tree on top of the large crate so that it stands tall. The caroling ended at this Christmas Village, so we were able to see the finished product. 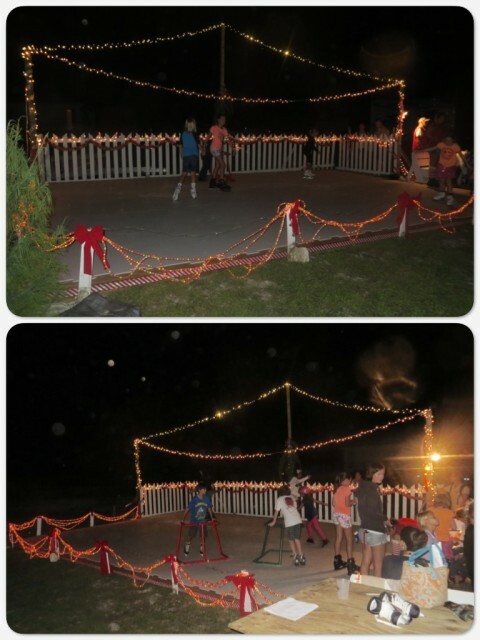 Who could ever imagine that a dusty ball field could be transformed into a twinkling magical holiday village? The Nativity, a tall Christmas tree, and a tent filled with goodies. 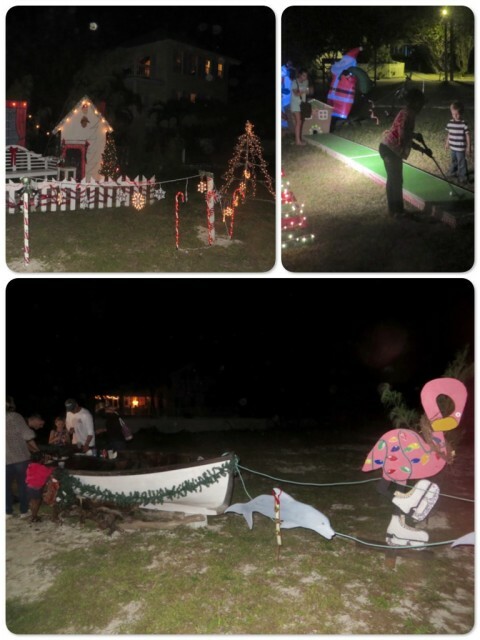 Christmas decorations, a one-hole mini-golf for the children, and a sleigh boat pulled by a flamingo. A skating rink! Really! The children used real ice skates on starboard ice. Amazing! 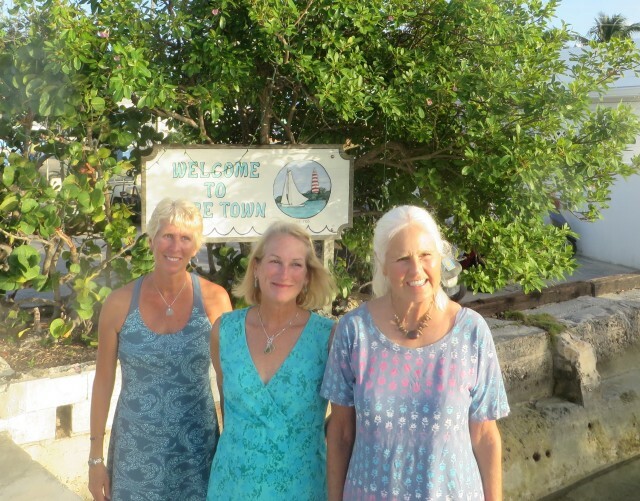 Only in Hope Town – you just have to love this place! Christmas Eve arrived and six of us headed down to PapaNasty’s for barbecue. We biked and the others walked (have to make use of these bikes after carrying them along for 1500 miles.) It was a delicious lunch. We had “pulled pork sundaes.” Try to imagine what that might be? It’s a BIG styrofoam cup layered with PapaNasty’s baked beans, spicy cole slaw, and topped with the pulled pork. So yummy, but we didn’t consider that we had a Christmas Eve party to attend! Sarah and Deanna we’re hosting their annual Christmas Eve Open House! Sarah and Deanna’s “Sea House” is perched right above the beach and Atlantic Ocean with a wonderful view. 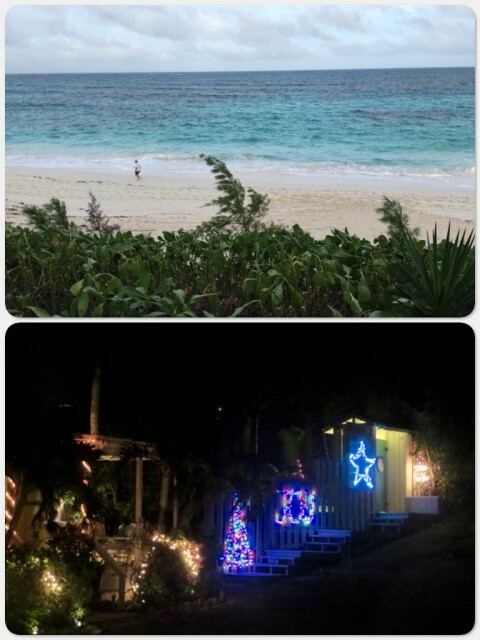 The path leading to little pink Sea House has the best holiday lights on the island. Joining in the Christmas Spirit, enjoying the company of dear friends. Anne and Dan, Will and Marcia, and the dynamic duo – Sarah and Deanna. 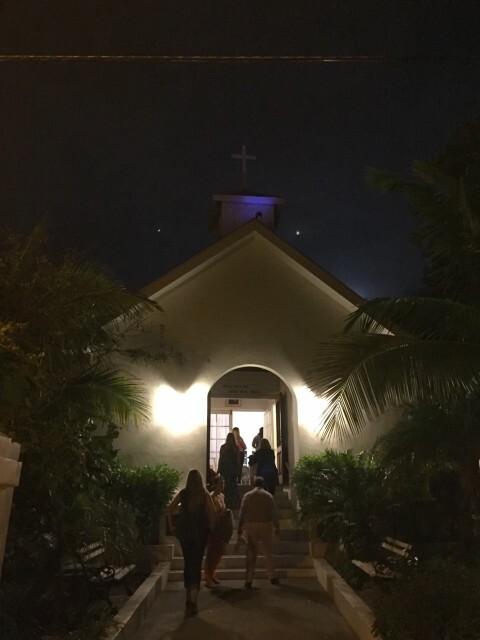 We attended the St. James’ Christmas Eve service when we left Sea House. I enjoy the simplicity of this little church. Voices raised in song, ears listening once again to the story of Jesus’ birth, and the glow of individual candles lighting our way home. Christmas morning began with sun and warm temperatures…… and apple raisin pancakes. 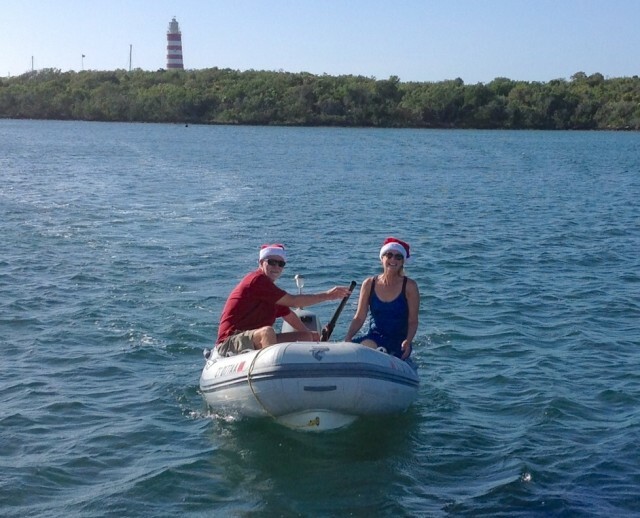 We donned our Santa hats and dinghied about, wishing friends a Merry Christmas! This blue clear water amazes us every single day. 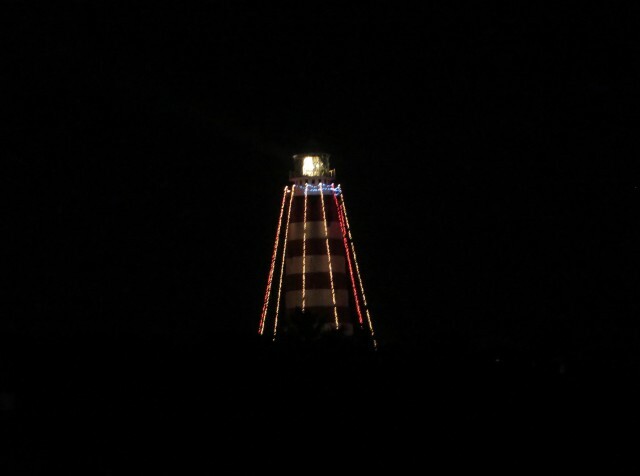 We may not have snow, but we do have this! 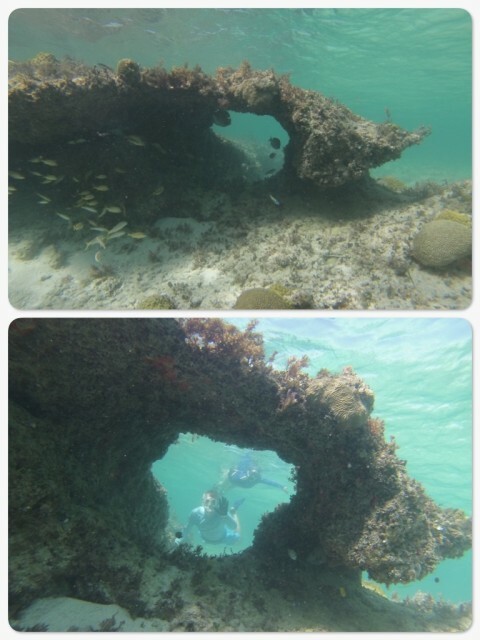 Dan had an underwater “go pro” camera and took a few photos of this coral arch near Johnny’s Cay. 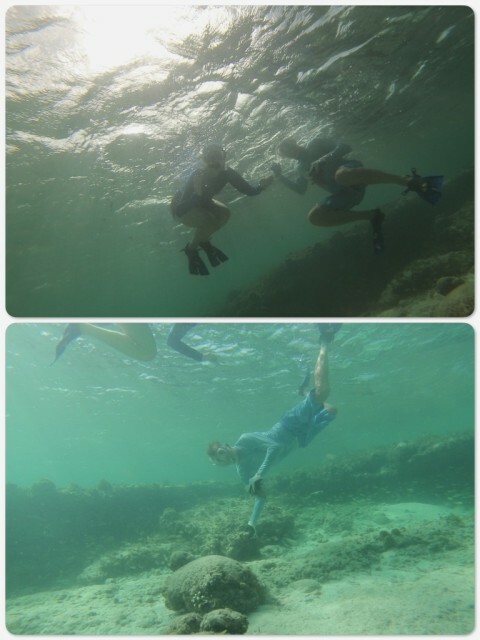 Let’s just say that Al and I need a lot more practice posing for underwater photos. 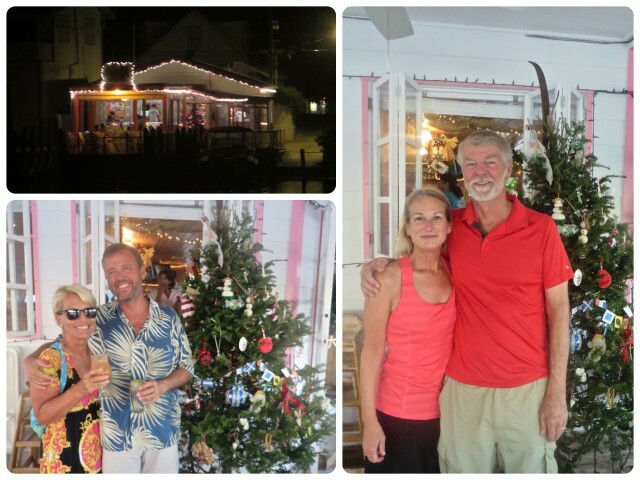 Eight of us decided to have Christmas dinner together at the Abaco Inn. Marcia, me, and Kayda, waiting for the van to pick us all up. Dressed up for Christmas dinner! 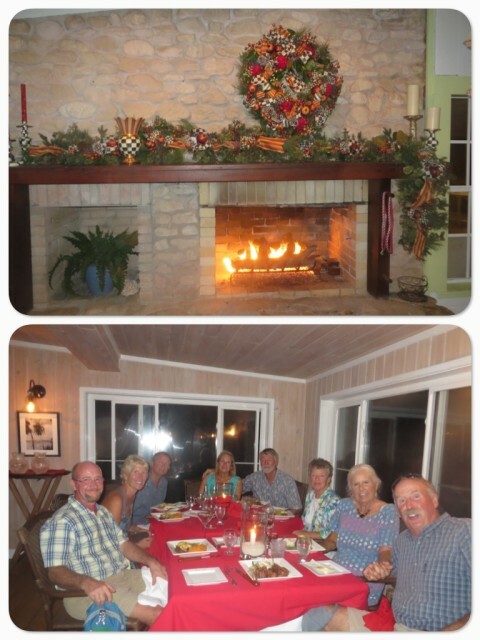 Christmas dinner with our “water family” at the Abaco Inn. Peter, Marcia, Dan, me, Al, Laurie, Kayda, and Sam. 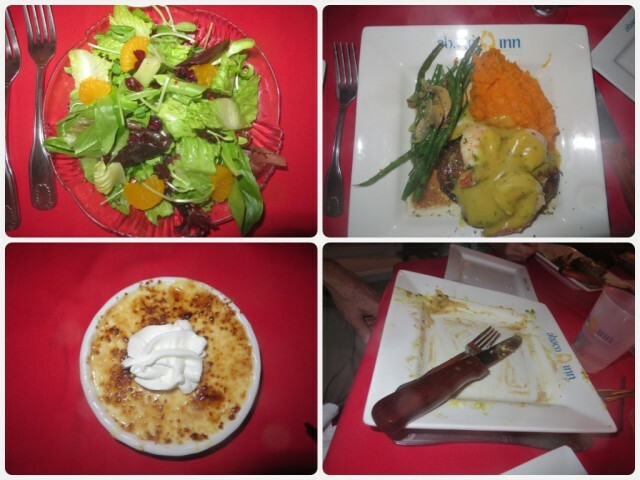 One of the best dinners we have ever eaten – sweet potato soup (no pic), salad, main course of filet on a portobello mushroom topped with shrimp and sides of pineapple sweet potatoes and green beans. Al cleaned his plate and still had room for dessert – raspberry crime brûlée. 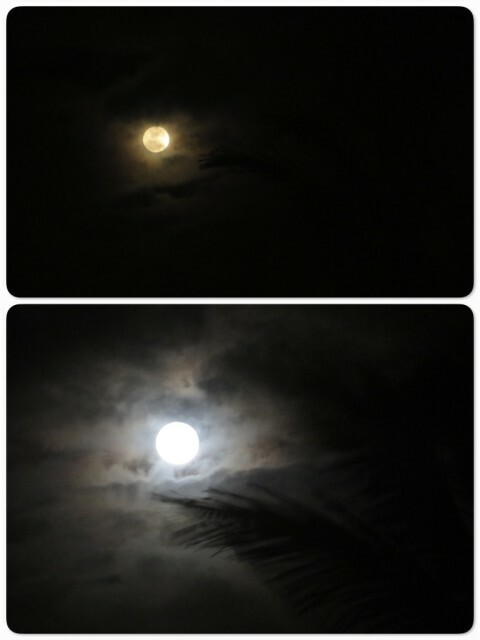 As everyone must know, there was a full moon Christmas night, first time since 1977. 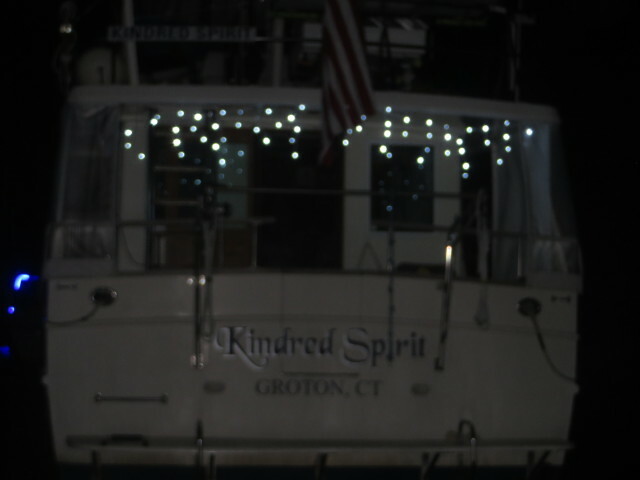 Kindred Spirit had her white light icicles lit up! 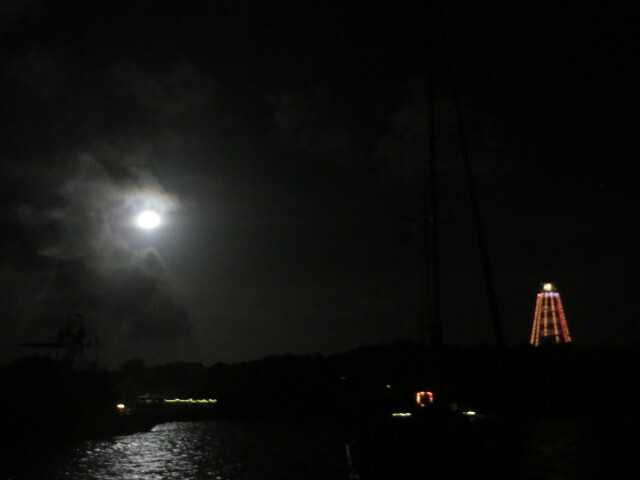 The full moon and the Elbow Cay Lighthouse together. 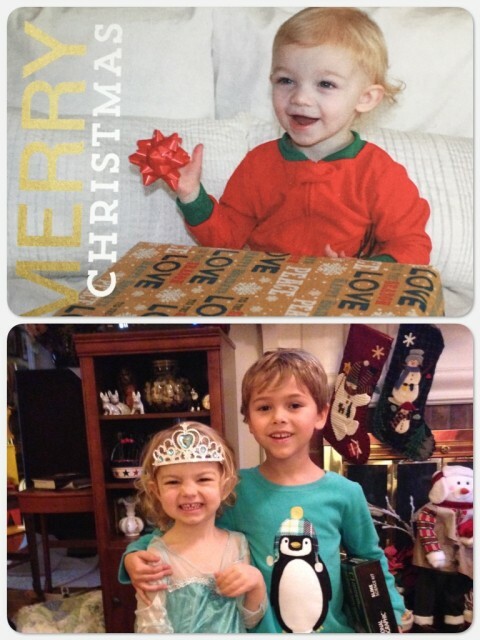 Our sweet little munchkins – Caleb, and Ella and Aaron. I can now also add that we will be grandparents again. Adam and Steph are expecting a baby girl in June. YES, we will be home by then! We hope everyone had a special Christmas – Merry Christmas to you all! My wonderful MacBook Pro has “died” for unknown reasons. Started it up just fine yesterday morning, turned around to pour my cup of tea, looked back and saw a black screen. We have tried every possible solution found on the Internet. Nada. Doesn’t make a sound and it doesn’t do anything. Only 2 1/2 years old! I began my retirement years and this blog with it. Will my retirement end with the laptop? 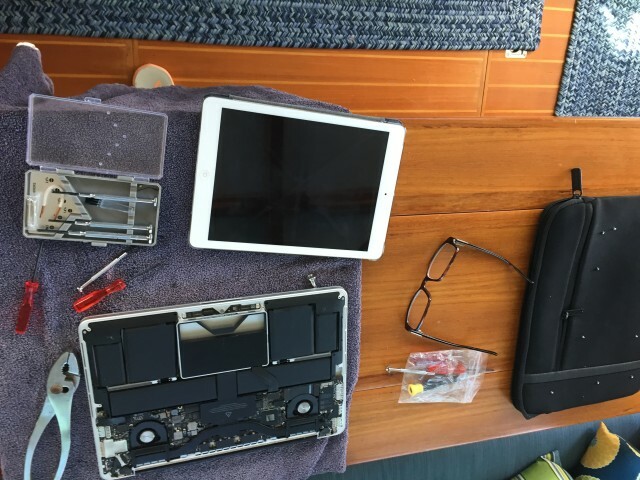 Will the blog have to end without the laptop? My mechanically gifted Captain even removed the back to take a look. Lots of dust inside. Disconnected the battery from the motherboard and put it back. Evidently there was a slim chance that might get it going again. Nope. Here in the Bahamas, there are no Apple stores, no Genius Bar, and no way to telephone Apple Support, who would in all likelihood tell me to take it to an Apple Store. Using his iPad to google what it should look like inside, Al gave it his best shot. So, here it is, the Night before Christmas, and all through the ship, not a gigabyte was stirring, not even a chip. It’s easy to say that this is a wonderful opportunity to get “unplugged,” but I’m not feeling that way. I imagine that it would be a challenge for most of us to give up our computers, even for folks like me who did not grow up with this technology. That Mac held a lot of our lives in it – ALL of my photos, important documents and information, and numerous spreadsheets (I’m a former math teacher, I have a spreadsheet for everything). Yes, everything is backed up on an external hard drive (about 2-3 weeks ago?) but that doesn’t help me here and now. That will only help when this Macbook is repaired or replaced. It was also my method of staying connected, especially through my blog. I’m not sure if I can continue doing the blog without my trusty (haha) Mac. 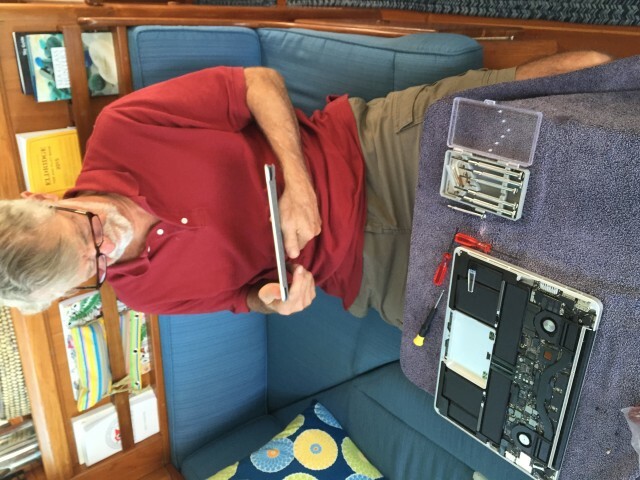 I’ve always imagined that I would someday revisit our cruising and boating years through the blog, when we are old(er) and gray(er). I wrote it primarily for me, as a journal and record. Now what do I do? First, I have to put it aside and remember that it is Christmas. It would be even worse to lose my Christmas spirit because of this technological stumbling block. So, off we will go to a lovely Christmas Eve party at Deanna and Sarah’s island home, followed by the candlelight service at St. James. Life and living is about people, not machines.